We first started looking at Mobile Apps for Education and Learning in February time and it seems to have taken a long time to get to where we are now. We're not finished as it will always be an ongoing project but hopefully we will have a working app very soon. 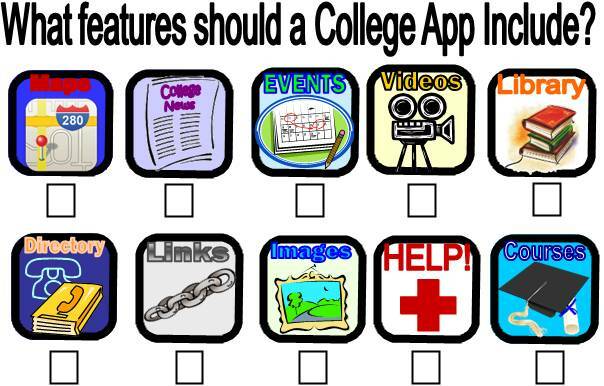 When we are started we had three strands - one was to investigate suitable apps for education and promote them to students and staff, secondly to acquire devices and install apps on them that could be borrowed and used effectively and thirdly to have a College app created and available for everyone to download. The first part has not moved along much really but I'll pick it up again after January. I've not made much progress because of problems with wifi in College and although there is supposed to be some College iPads we have to get round some authentication and proxy issues. This is the second part too really although we have got some iPod touch's which we have used with some apps including QR code readers. So the third part - we had asked students what they wanted it to include plus we knew that we wanted to have access to our VLE, Blackboard via the app. Therefore we set about investigating the feasibility of producing the app through Blackboard - it's not possible to access a mobile version of Blackboard unless you use their solution i.e Blackboard Learn. But we didn't want just the Blackboard Learn facility, we wanted it 'wrapped' in a customised front end / user interface. We wanted to include images, videos, maps, news etc. Blackboard do offer a Central App which can be customised. 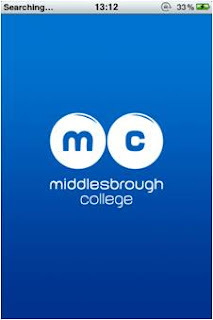 We produced our plan and went through the usual process of getting capital bid funding within College. We decided that we would sacrifice the content collection part of our Blackboard license if need be to fund the mobile. There was also the possibility that our marketing department had an app in the pipeline and that there would be too much overlap. We had wanted to have an app ready for September for new students and the new academic year but it wasn't possible. Once we had agreed the license changes with Blackboard then we were assigned a project manager to discuss our requirements and ensure that we got what we wanted. Our eLearning manager and eLearning technologist have worked really hard to make sure that the interface is exactly what we wanted. The Blackboard Learn part is straightforward - it's just there really and connects into the VLE in a mobile format. The 'central' part took more designing and developing. The important requirement was that it was one main app with everything else inside. We wanted students to go to the app store and download one app. 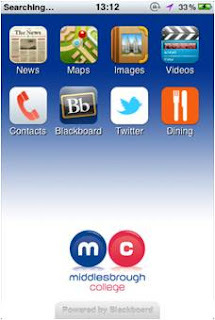 Once the app is opened then there are 8 sub apps - news, maps, images, videos, contacts, twitter, dining and Blackboard. The app has to be available for iOS, Android and Blackberry - from our questionnaire we knew we had lots of Blackberry users among our students. We have had a test build of the iOS App that we have tested and improved, also an Android version. The Blackberry one is still to come. 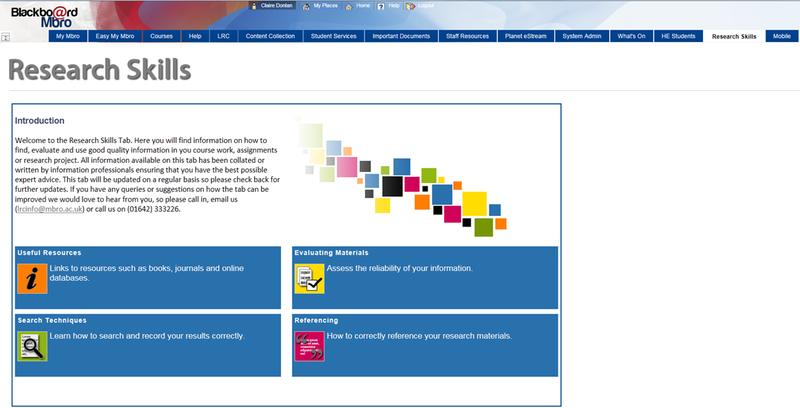 We have finally finished our new Research and Information Literacy Skills tab/site on our VLE. We had planned to do it over the summer holidays but it kept on being 'squeezed' by other activities and tasks. The need for a specific area on the VLE was highlighted last year for a few reasons. We have always had information available on the LRC site on Blackboard and via the LRC wiki but it was general and needed reorganising and promoting to make it more accessible. We have always done 'follow up' sessions which are basically additional sessions after induction sessions to cover searching, accessing e-books / online databases, referencing, bibliographies etc. but we wanted to look at creating and delivering dedicated materials and resources. Also last year after the IQER inspection I discussed with our HE Director the possibility of delivering sessions which were specific to HE learners and used the new resources we were creating. He was enthusiastic about the idea and suggested that it would be good for staff and students. We split the work up between our Library Services Manager, our Senior Librarian, our e-Learning Manager and me. We decided what we wanted to provide then each person put it together how they thought best and then we tidied it up to make it consistent. Each section is 4 or 5 pages of text and images. We will add more as we go along but wanted to get the structure and the basics there to start with. The tab is now being tested by the rest of the department and will then go live to all students and staff next week. As it is aimed at HE students we are going to create a Prezi to highlight the resources with practical examples of using them - how and where to search and what to do with the results. This will have to be in January as we literally have no time to spend on it at the moment although we are delivering follow up sessions on demand at the moment. A January start for the presentation will work as we are getting another IQER inspection in February so it will fit in well with that in the Spring term. It will look similar to this (although it's not live just yet). This week we have finally launched our QR code Tour of the LRC. The idea was discussed a few months ago and I was keen for us to use QR codes in a variety of ways. We've incorporated them into leaflets and information guides and also displayed them on book bays to link to searches in the OPAC. Our e-Learning Technologist and LRC Modern Apprentice worked together to plan and produce the tour and have done a brilliant job. They are both creative and efficient so produce results that look good and work well. There is a poster showing the first clue as you come into the LRC which gives you instructions about where to start - there are also instruction cards with more info explaining what QR codes are and how to download a QR code App to your smart phone. Each poster has a QR code which, when you scan it, shows information text which tells you about the place or resource that you are at and also where to go next. We decided to have the QR code lead to text rather than to a URL because it is quicker, easier and doesn't rely on wifi. This makes it suitable for a wider range of learners and is more 'instant' which will engage learners more fully. The route takes you round the different book sections, different areas such as multimedia, quiet study, printing and also the views such as temenos. The posters are really appealing - hardly any text but great images ( I would show examples but don't want to spoil the surprise element). There are prizes - chocolate coins in true treasure fashion. I've set up an iPod touch with a QR code App so if students or staff want to try it but don't have a smart phone, then they can do. A few students have tried it but we have only started advertising and promoting it this week so I'm hoping for quite a few to give it a go. We might use it as part of induction for late starting courses as a self directed activity. In previous years we've had a podcast tour so this is another alternative. It will be interesting to see how students engage with it and also how different QR code Apps on different mobile devices compare.